There are at least two persons with the name Jie Li (Western ordering) or Li Jie (Eastern ordering). Li Jie is a Chinese professional (李劫); Jie Li is an American amateur. 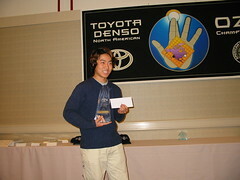 Jie Li made outstanding results in the 2001 and 2008 North American Toyota Denso Oza Championship, when he was undefeated against 4 pros, including 9-dan Jiang Zhujiu, 4-dan Jimmy Cha, 7-dan Jiang Mingjiu and 1-dan Huiren Yang. Recently, he defeated a few more professionals including 9-dan Feng-Yun, 1-dan Lin Xuefen, 3-dan Suzuki Ayumi, 7-dan Kim MyungWan and more. The Fall 2001 / Winter 2002 issue of American Go Journal features him on the cover, and has two of his games plus a brief biography. US Open Championship 1998, 2002, 2003 and 2004. North American Amateur Ing Cup in 2002, 2004 and 2005. Texas Open 2004 and 2005. Cotsen Open 2004 and 2005. North American Toyota Denso Oza Championship 2001 (West) and 2008 (East). US Masters 2005 and 2006. Interests include reading, traveling, teaching "and playing anonymously on the Internet." The game record from the 3rd round of the 2001 Toyota Denso Oza tournament, when Li beat Jujo Jiang, was posted in rec.games.go and is on the web with commentary by Li at http://www.hilltopgo.com/agej/2002/Toyota_2001_Oza_Jie_Li-ZhuJiu_Jiang_ver2.sgf. Juan: On November 28th, 2004, Jie Li defeated Suzuki Ayumi 3P in the 5th Tokyo Seimitsu Cup finals, breaking the U.S. losing streak. Suzuki, the current titleholder of "Strongest Woman" in Japan, was forced to resign in the game with Jie Li, who took black. After the game, a Japanese pro commented that black was "very strong". NeoNemesis : He beat Kim Myung Wan 7p? in the 2005 congress also. Kim Myung Wan is a very strong Korean professional who made it to the top8 in the samsung cup. Kim also defeated Lee Sedol before, which makes Jie a very possible champion if he ever participates in the WAGC. He is undoubtedly my idol in the go world. I feel that if he were pro, he would be up there with Lee Changho, Lee Sedol, Gu Li, and the others. pwaldron: Jie Li's game with Kim Myung Wan was extremely exciting, but it was a handicap game (even, no komi). MysticoN? : According to Gogameworld he reached pro 1 year after he started playing go ! uchiha: I think that's supposed to be 1D. I read he reached 1d in one year in the 2003 AGA yearbook. He has an account on KGS with the name JLi for the purpose of communicating about Go; it is not a playing account. Feel free to contact him with any questions you might have. If you are a member of the AGA, look in the November 29, 2004 eJournal edition. It includes an SGF of their game, analyzed and commented by Jie Li himself. He was the US representative to the 22nd Fujitsu Cup (2009), where in the first round he lost to Hane Naoki by resignation. Here are more photos of Jie Li from the same tournament.